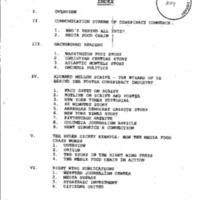 This collection consists of a binder titled “Communication Conspiracy” from the staff and office files of Jane Sherburne from the Counsel’s Office. The binder mostly consists of news articles and summaries. These records describe the means by which news organizations received and published stories, reports, and editorials concerning President Clinton, his staff, and his administration. 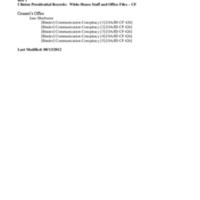 FOIA 2007-0080-F - "The Communication Stream of Conspiracy Commerce"